A guided tour inside the Prado Museum, a visit to Palacio Real, Europe's largest palace, and a stroll in the shaded park of the Spanish royal family. With this custom tour, you pick what you want. As you join a born-and-raised local, you make the most of all that Madrid has to offer. You tell your guide ahead of time what you want to see and we pre-plan your perfect day in Madrid – complete with complimentary transportation. This way, you can absorb the city as soon as your guide picks you up at your hotel. Treat yourself to an exciting local perspective tailored to your interests. Whether you like history, art, food, or anything else, your guide will help you make the most of your time in Madrid. Make the most of your time in Madrid with this premium service. 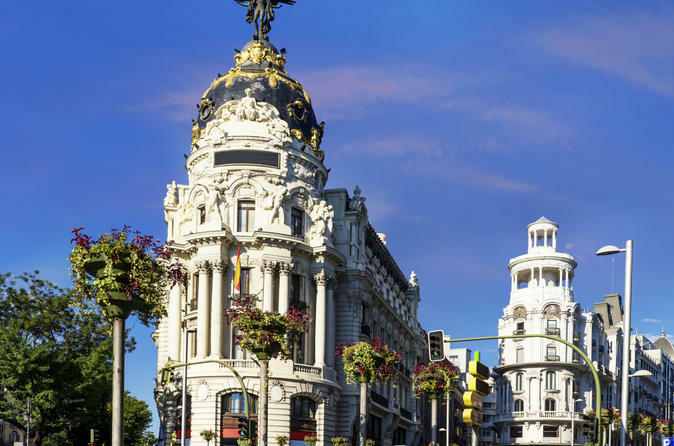 Discuss your interests ahead of time with your guide, then simply look forward to discovering Madrid according to a personalized itinerary – complete with transport and recommendations from your local guide. On the day of your tour, your guide meets you at your hotel. You can make any final adjustments as you set out to see Madrid's legendary landmarks. Venture to the Royal Palace of Madrid to admire the structure’s imperial majesty. Enjoy skip-the-line tickets into the Prado Museum to experience the masterworks of Velasquez, El Greco, and Goya. Discover secluded secrets like El Rastro, the city’s old flea market. Marvel at the neoclassical splendor of the ancient Alcalá Gate. And enjoy the sweet life of Madrid like a local.